Matcha is an incredible source of antioxidants, vitamins, and minerals that make it a great drink. Most people turn to coffee when they need a pick me up; others may turn to sugar and energy drinks. Let’s look at some of the benefits of drinking matcha. What About the Caffeine in Matcha? Matcha is green tea that is shade grown and never heated like normal green tea is. 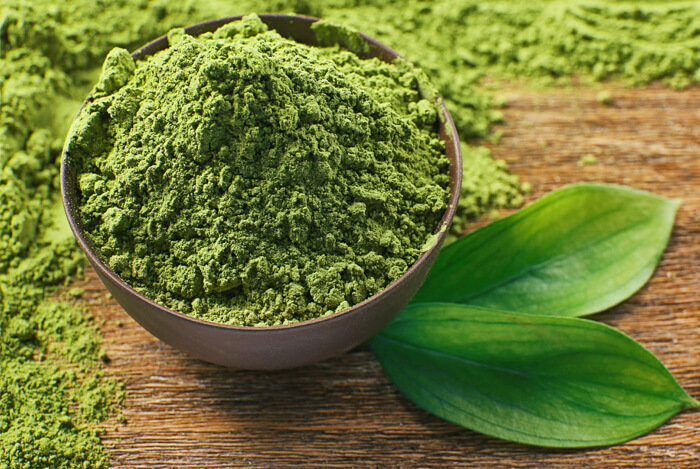 Because it is not processed, it retains a bright green color and has a slightly sweeter and lighter flavor than regular green tea, although matcha still retains the grounding earthy and grassy notes that regular green tea does. 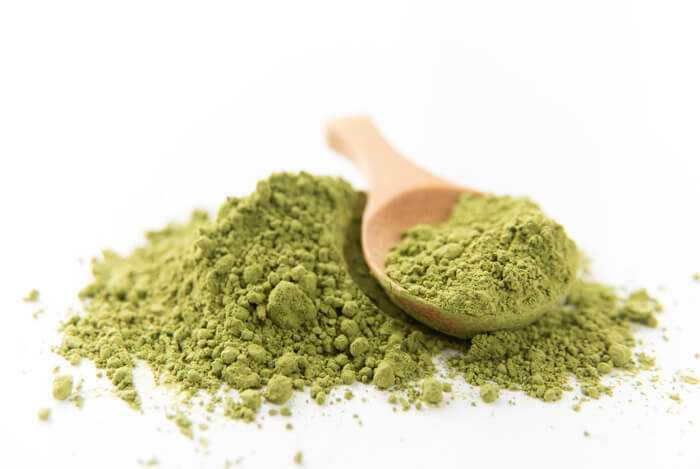 Matcha also contains a much larger amount of the amino acid L-theanine than regular green tea. Matcha has about ½ the amount of caffeine as regular black coffee per serving. Matcha is also a great source of minerals and is higher in the antioxidant compound EGCG than regular green tea. 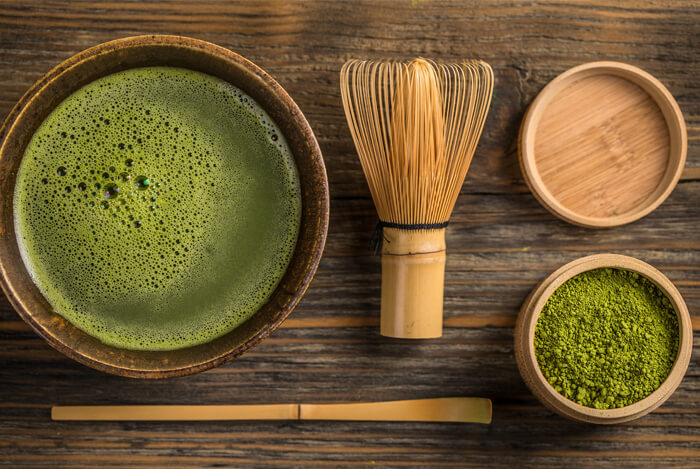 So, now that you know the benefits of matcha, here are five ways you can consider adding it to your diet. When all else fails, you can add just about any natural superfood like matcha to a smoothie. Smoothies are convenient and easy to make, and they can even be made into smoothie bowls by reducing the liquid by ½ a cup or so. When it comes to smoothie choices, however, they’re not all created equal. Smoothies can be filled with equal amounts fresh fruits and veggies (or greens) and be packed with only nutrient-dense foods. Matcha is great to use in smoothies because it’s a natural superfood that lends an earthy flavor and balances out the taste of sweeter fruits. Here’s a recipe you can use to test out matcha in a smoothie in the morning or afternoon. 1. Add all the ingredients to your blender in the order listed and blend on low, then progress to high until you have a thick and frothy drink. Enjoy! One little tip: Be sure not to consume matcha in a nighttime smoothie. 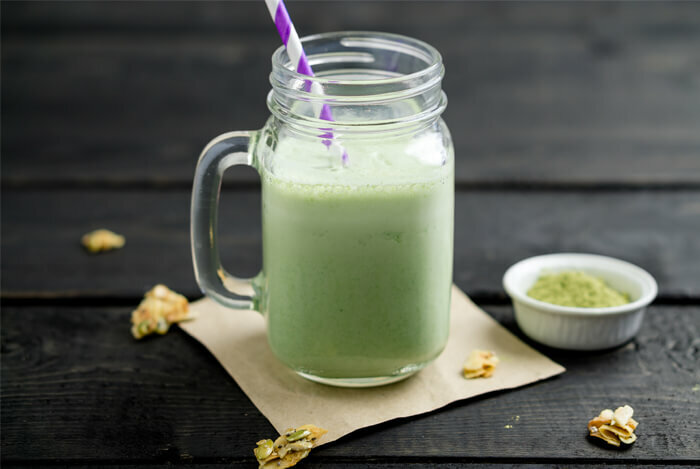 Although it has a calming effect and doesn’t cause jitters like coffee, a smoothie made with matcha may still keep you awake at night since matcha is a natural source of caffeine. If you love the way a cup of hot coffee makes you feel in the morning, then go for a warm matcha latté instead. Matcha is traditionally made into a warm beverage by natives of Japan where matcha originates from. You can create a similar warm beverage at home and upgrade it just a bit to help it feel more like a coffee drink. The key to making a warm matcha latté is to bring the water to just under boiling heat so it doesn’t get too hot. Bring the water and non-dairy milk to high heat in a pot on the stove or a kettle. Let it heat just until it starts to bubble, right before boiling. Turn off the heat source and remove from the stove. Add the warm liquid into a blender and add the matcha and sweetener if using. Blend until frothy, pour into a warm mug, and enjoy! 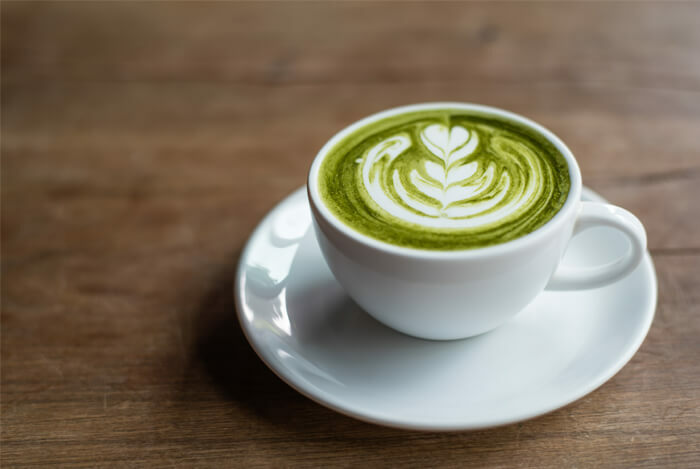 Some people also like to add a teaspoon or so of coconut oil to their matcha latté for a more filling beverage that also provides more energy since coconut oil is a natural source of MCT fats. Be sure to choose extra-virgin coconut oil if you want to try this option out and blend it with the matcha and warmed water. You can also add maca to a matcha latté for an extra source of caffeine-free energy and a nice, warming caramel flavor. Experiment with a few different recipes to see how you enjoy matcha the most! Energy balls and bites are normally made with oats, nuts, seeds, coconut, dried fruit, superfoods, and/or nut butters. You can really make them into anything you want and swap out a variety of healthy ingredients for one another. 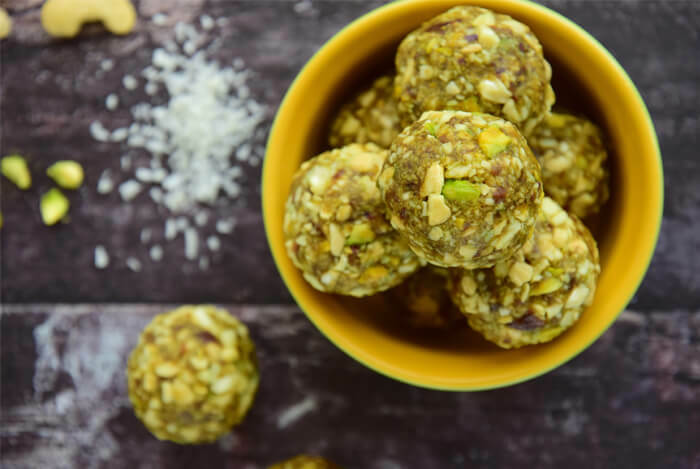 Energy balls and bites can be enjoyed at the office, for a quick breakfast when you’re out of time to eat a real meal, and they’re a great dessert to enjoy in place of cake and cookies. Best of all, you make a huge batch of energy balls and store them in the fridge for 2 weeks or the freezer for 1 month so you’re always prepared. Matcha makes a great addition to energy balls and bites since it’s naturally energizing and it adds a fun color. Ready to try it out? Here’s a healthy energy ball recipe to trying using matcha that you can try. First, soak the dates and raisins (or goji berries) in water for at least 30 minutes (if the dates are not pitted, remove the pits before you soak them). When you’re ready to make the energy balls, drain the soaked dates and raisins and reserve ¼ cup of the soaking water. Set aside. Add the oats, raw almond butter, soaked dates and raisins, coconut, and matcha powder to a food processor in that order. Add any additional superfoods if using. Then add the ¼ cup reserved soaking water on top (this helps it blend better). Process until you get a thick, sticky dough; it should look like a thick ball of cookie dough. Turn off the food processor, and scoop out the dough into small balls with your hands or you can use a small cookie dough scoop. Roll each segment of dough into a uniform ball until smooth, and place on a glass plate or a baking pan covered in parchment paper spaced out evenly. Once all the balls have been made, pop them in the fridge for an hour or the freezer for 15 minutes to set. Store 2-3 balls in baggies for easy servings and keep them in a covered container (with a lid) in the fridge for 2 weeks or the freezer for up to 1 month. This recipe makes about 20 (1.5” x 1.5”) energy balls. For a fun pop of color and a natural energy boost, make yourself some warm oatmeal or overnight oatmeal and add matcha to it. 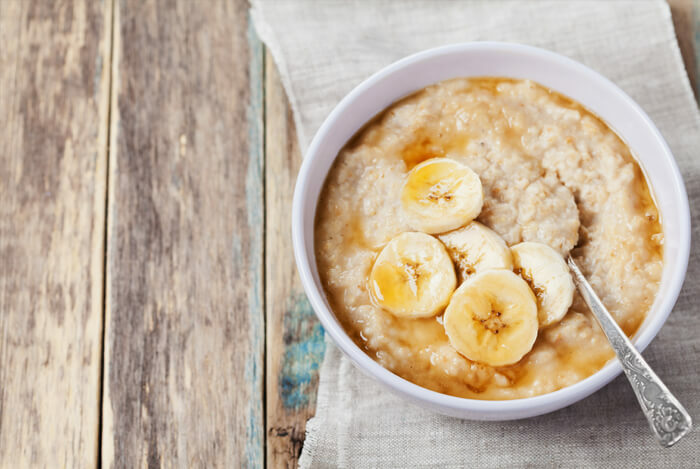 Oatmeal is already a fantastic source of energy you can eat each day since it’s high in protein, complex carbs, B vitamins, and minerals such as iron and zinc. The key to adding matcha to oatmeal and having it taste great is to add some form of sweetness to balance out the natural grassy flavor of matcha. Optimal options include bananas, stevia, and blueberries or raisins. Here’s a delicious and easy overnight oatmeal recipe that you can use matcha in. Add the oats, flax, chia, and matcha to a bowl or mason jar. Sift to combine. Next, add in the banana slices and frozen blueberries(these will melt overnight and create a naturally sweet syrup). Pour on the non-dairy milk on top of the mixture and stir just until incorporated. Cover and put the bowl (or jar) in the fridge for at least 6 hours to set or overnight. Remove and enjoy for a quick breakfast on the go! To prepare this recipe into a hot bowl of oats, cook the oats on the stove in the milk as you normally would, let them cool for 2 minutes, scoop the mixture into a bowl, and then add in the rest of ingredients before serving. 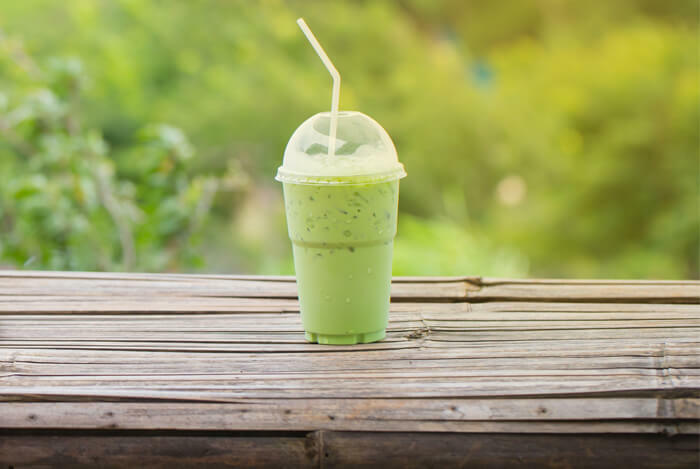 Here’s a fun way to use matcha to cool off that’s a much better replacement to sugary slushies sold in stores or food carts. This recipe idea is a great option before or after a workout by adding a scoop of protein powder. Add the ingredients into a large blender or a personalize blender and blend. Pour into a serving glass or to-go cup and enjoy! When purchasing matcha, be careful how you spend your money. Matcha green tea should never be a dark, ruddy color; it should be a bright, spring green color that nearly glows. Matcha is not cheap, but a little matcha will go a long way and you can choose to reduce the amount per recipe to stretch out the servings even further. Get at least 8 hours of sleep. You have to give your body what it needs by resting properly each night so it can give you the energy you need. Here are some tips to try if you have a hard time getting to sleep at night. Exercise each day. 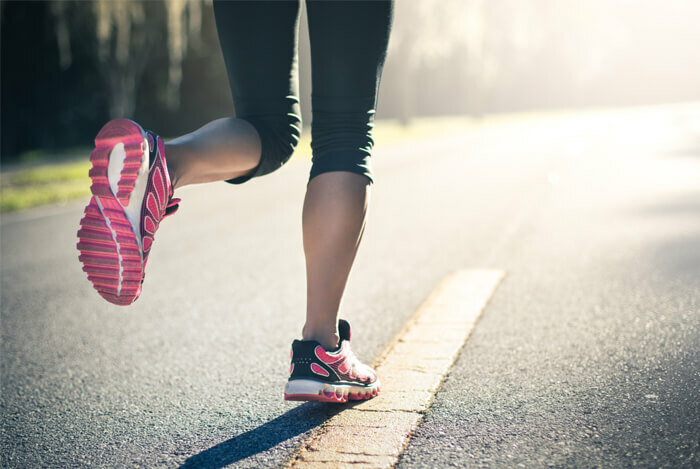 Even just 30 minutes can give you a boost in metabolic function and it’s a great way to improve your mood too! Now, pick yourself up some matcha at a health food store or online and give it a try. Here are some other foods you can also use to improve your energy naturally too! What’s your take on matcha tea? Have anything else you’d like to share? Let me know in the comments below!